Sweet potatoes are one of those things that seem too good to be true. They just seem too delicious to be good for you! I love sweet potatoes. One of my favorites things to have for lunch is a microwaved sweet potato mashed up with cinnamon and honey. 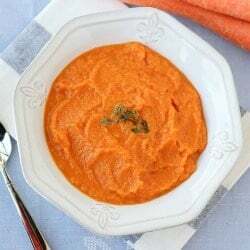 Another great healthy topping for sweet potatoes is applesauce. I am all about decadent sweet potato casseroles, loaded with butter and brown sugar, around the holidays. In fact, my Mom’s sweet potato casserole is my favorite dish at Thanksgiving. 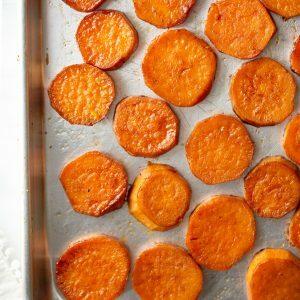 But the dessert-like creations of November and December need not outshine the simplicity of a simple and healthy sweet potato. I think without all the dressing up, you can really marvel at the true natural sweetness of a sweet potato. Roasting accentuates this sweetness even more. This soup was inspired by a sweet potato soup I had at one of my favorite restaurants in San Diego, Tender Greens. If you are ever in San Diego I highly recommend you try Tender Greens! Their salads are unreal. My favorite is the Craft Salad, which is loaded with pickled vegetables, olives, feta, house-made salami, and baby greens. Their sweet potato soup was a perfect accompaniment to these bold, tangy flavors. I can’t think of many things this soup wouldn’t be a great with! 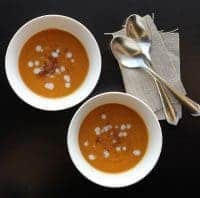 Warming sweet potato soup with sweet onions, cinnamon, and a dash of coconut milk. Preheat oven to 400 degrees. 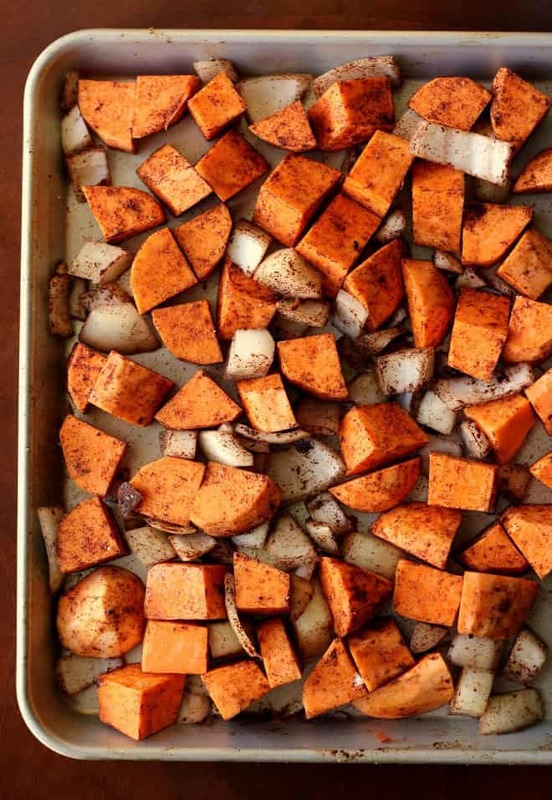 On a large sheet tray, toss the cubed yams and onion with the cinnamon, 1 teaspoon salt, and olive oil. Spread into an even layer and roast for 35-40 minutes, until yams are soft and fork tender. Combine the roasted vegetable in the blender with the stock/broth, coconut milk and honey. Blend until smooth. Season to taste with salt and pepper. Adjust thickness to your liking with more stock if desired. Once blended you can heat in a saucepan if needed. Serve and enjoy! 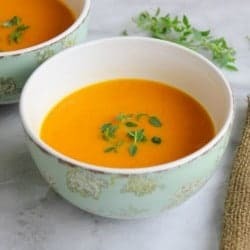 Can you freeze the sweet potato soup? Yes I think this soup should freeze great! This is a wonderful soup. I am making it for the second week in a row. Today I am using half and half yams and sweet potatoes since that if what is on hand.